1980-1983 graduate from Ceramic school of Slovakian majolica in Modra. 1983-1985 he expanded his knowledge at Secondary school in Bratislava where he focused on artistic trade. 1988-1990 He started to work in workroom of Jozef Franko where he gained his first knowledge how to make and product a ceramic fireplace. 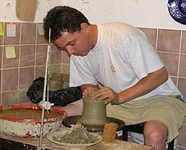 In 1993 he started his own ceramic business and establishes a partnership with Tatiana Homolayova.They aimed to keep their work at Haban’s traditions. 1979-1982 Graduate from Ceramic school of Slovakian majolica in Modra. 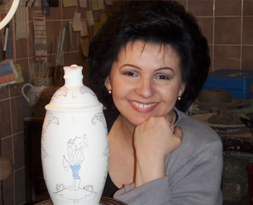 Till 1989 she worked as a decorator of ceramic for SLM in Modra. In 1989 she become independent and started to create her own collage of pictures. 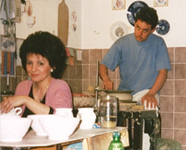 From 1993 she became to be a partner with Peter Luzak in workroom in Zahorska Bystrica where Tatiana enriched their production by her artistic decorations.